Thrilling Costa Rica zip line & canopy tour adventures! The extremely popular adventure sport that gives people the opportunity to traverse from tree-top to tree-top by way of a series of cables has many different names. Most commonly it is referred to as “zip-lining” or “canopy tour.” Zip line tours in Costa Rica are one of the most sought-after activities for visitors to do when visiting the country. Most of the major destinations in Costa Rica offer some form of a canopy tour or zip line adventure. The history of this adventure activity dates back to biologists who sought to study the canopy of the Costa Rican Rainforest. These biologists wanted to get long-term, close up views of the life and environments that existed in the canopy of the rainforest in Costa Rica. At first, biologists would set up a platform or canopy camp in one specific tree and their observations would take form from this one tree’s canopy. As time progressed and biologists sought to study more than just one canopy they developed methods to traverse from one canopy to another by means of cables, harnesses & pulleys. The individuals that were given credit for this advanced system of rainforest canopy observation were graduate students, John Williams, and Donald Perry. Rock-climbing enthusiasts seeking a closer view of their botanical and entomological subjects, they adapted their equipment to climb trees, clipped themselves to a line, and zip-lining was born. 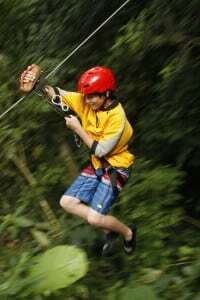 As years went on various tour businesses created canopy & zip line tours in Costa Rica. Zip line tours are made up of various platforms built into and onto trees in the rainforest. These platforms are normally located high in the tree-tops, can vary in distance from the ground, and act as stations between cables that stretch from tree to tree. As this activity continued to develop and gain popularity in Costa Rica, many canopy tour operators began to get creative by integrating other activities into their canopy tours. Instead of a series of 12 cables, an operator would often times install or set up a waterfall rappel section or a hanging bridge. These types of variations would be substituted for a cable and add some variety to the tour. In some cases, these tours begin with a horseback ride, tractor ride or brief hike to the first cable. What to Consider Before Taking a Canopy Tour in Costa Rica? Travelers can find canopy tours in virtually any part of Costa Rica: from the Central Pacific region to the Caribbean Coast and everywhere in-between. Some people want to see wildlife, including the beautiful birds that Costa Rica has to offer. Others are looking for an adrenaline rush or to conquer their fear of heights. Many want to do both!We can guarantee the adrenaline factor will be present, however, it can be difficult to spot wildlife aside from birds. Often times the animals in the rainforest will stay away from these cables knowing that people are around. From time to time a sloth can be spotted and you can always expect to see some birds on tours like this. The length and height of the cables vary immensely. Some canopy tours will only take you as high as the canopy goes and others will have a cable or two where you will soar above the forest like a hawk looking for its prey. Both experiences are great, and being surrounded by the tree’s canopies is magical. You do not need to be in incredible physical condition to participate in a Canopy or Zip-line tour, but you do need to be able to walk on your own and to keep your back slightly bent when sliding down a cable. That been said, there are no rules about the maximum age to be able to participate, but there are rules about minimum age. Some canopy tours will allow children as young as five years old to go by themselves on the cables, some will let younger kids ride with a guide. Most canopy tours have a minimum age limit of seven-years-old. Another essential thing to consider is that most canopy tours will run even under the rain, so be prepared to get wet. Only under stormy and windy conditions could the zip line/canopy tour be canceled or postponed. To be prepared for your canopy tour bring comfortable clothes, bug repellent, sunscreen, and a raincoat if it looks like it might rain on you. Also, bring closed-toe, comfortable shoes. Sandals and flip flops can be lost in the forest as you ride the cables, and remember you might have to walk a bit from one cable to another in the forest floor. Where to do Zip Line or Canopy tours in Costa Rica? Costa Rica’s zip line & canopy tours are most popular in the Arenal & Monteverde regions. The sport was “founded” in Monteverde and the original canopy tour operator still runs these tours there. There are close to two dozen canopy tours in this area. Some are rustic and charming (but safe) tours run by families or rural tourism programs. Some are huge and high tech with longer and higher cables. If one of your goals during your Costa Rica trip is to experience a good canopy tour, you really should include Arenal and Monteverde area into your itinerary. After the Arenal and Monteverde Area, the Central Pacific of Costa Rica offers the second-most significant concentration of canopy tours in the country. Whether you are in the Jacó, Manuel Antonio or Dominical area, you will find several good options to experience the treetops of Costa Rican forest. The difference here is that you will also see a bit of what the dry forest of Costa Rica has to offer, especially during the dry season, unlike Monteverde and Arenal area where the rainforest prevails. In this part of the country, specifically in the Sarapiquí area, you can also find a few canopy tours to enjoy. One of the nice things about experiencing these tours is that you will be submerged in very lush rainforest. Also, some of the canopy tours offer a night tour, which is a totally different way to experience the forest. Interested in a Costa Rica zip line adventure or canopy tour? Let us plan a trip for your next adventure!